The opening scene is a botched bank robbery that results in a prolonged shoot-out between the Wild Bunch and bounty-hunters, with civilians including women and children caught in the cross-fire. 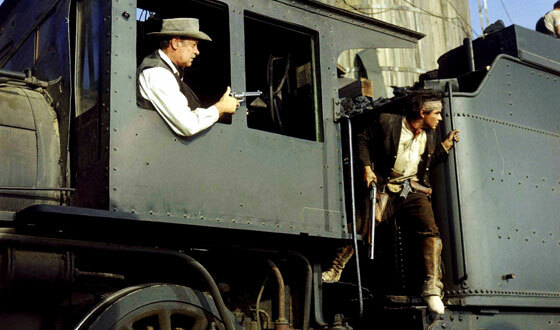 In the middle of the movie is a smooth, old-fashioned train heist to seize weapons and ammunition. 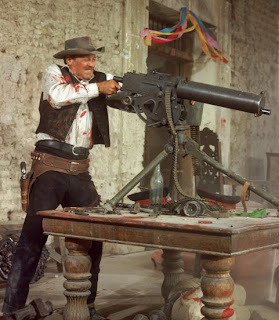 And the movie ends with a long, gory, final battle, more of a meat-grinder suicide mission, as the Wild Bunch, all four of them, take on an entire Mexican army battalion gone rogue. Sam Peckinpah's epic western The Wild Bunch does not have the wit or sly artistic stylings of Sergio Leone's The Good, The Bad, and The Ugly or Once Upon A Time In The West. But Peckinpah does satisfyingly saturate The Wild Bunch with a desperate mood of gloom for an entire class of men, as the era of living the outlaw life comes to an end with a bloody exclamation mark. He also introduces a poetic and lyrical style of portraying violence, aided by magnificent editing (Lou Lombardo) and cinematography (Lucien Ballard), that set a new standard and blurred the line between condemning and enjoying violence. The story follows Pike Bishop (William Holden) and his gang of ruthless bandits, including Dutch (Ernest Borgnine), brothers Lyle (Warren Oates) and Tector (Ben Johnson), and the Mexican Angel (Jaime Sanchez), who make a living robbing rail company payrolls. The rail companies start fighting back just as ruthlessly: a rail company baron hires Pike's former partner Deke Thornton (Robert Ryan) to lead a group of bounty hunters to halt, once and for all, Pike's rampage. Deke and his men botch the ambush that opens the movie but still manage to decimate Pike's gang down to five men. Deke chases Pike and the remnants of his Wild Bunch across the border from Texas to Mexico, where Pike and his men encounter the slimy General Mapache and his men, who are terrorizing local villages while entertaining some seedy-looking German army types. Pike and his men fend off Deke and attempt a double-cross game of helping Mapache and the villagers to secure guns and ammunition, but with Deke closing in, Mapache reveals himself to be as despicable as any gangster, and Pike ends the misadventures of his gang in a blaze of bloody glory. Between the film's three main action set-pieces, there is plenty of time for Peckinpah to elaborate on the end of a way of life. He does so through conversations between Pike and Dutch, flashbacks, and expanding on Deke's internal conflict as he chases down his former partner. The movie is set in 1913, and the startling appearance of a motor vehicle, being used by Mapache's men, is a stark reminder that the outlaw cowboy days are well and truly coming to an end. The film is populated by Western movie stalwarts and character actors, all of them grimy, dirty, desperate, and in a nod to Leone, none of them good, just shades of conflicted. The absence of an outright movie star helps to focus attention on the impact of the changing times on men in general, rather than any individual. Peckinpah also marks the beginning of a new epoch in film-making by redefining the boundaries of acceptable violence, blood and gore in mainstream American movies. Ironically, rather than usher in a new age of realistic westerns, The Wild Bunch proved to be both a chronicler of an era that had passed, and the final word in western movies. It stands alone, tall in the saddle.